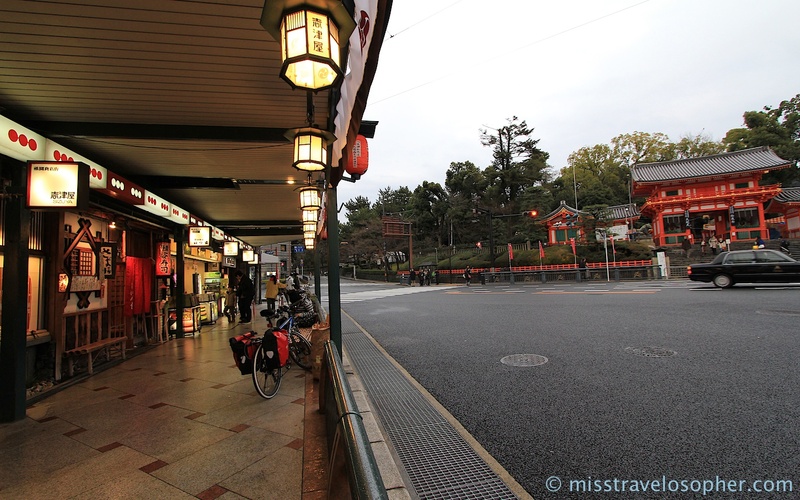 Looking for good food around Gion? 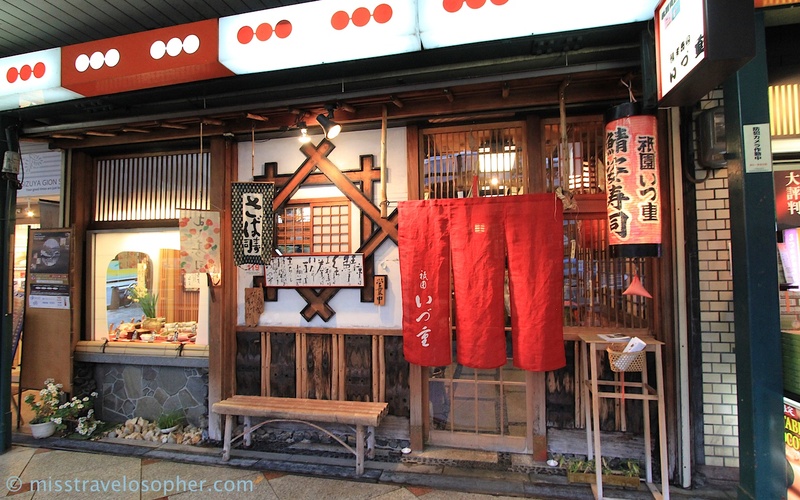 How about a place to eat delicious Kyoto style sushi while sightseeing? Introducing my latest find – Izuju Sushi (祇園いづ重), right in the heart of Gion and just across the gate of the famous Yasaka Shrine! Izuju Sushi has a longstanding history since almost a century ago and is famous for serving up traditional sabazushi (鯖寿司) and inari sushi. The location is great as it is directly across Yasaka Shrine, in the heart of Gion geisha district. If you are sightseeing in the Gion area, this is a great lunch or dinner place to go to. Firstly, let me shed more light on what Kyoto style sabazushi is. 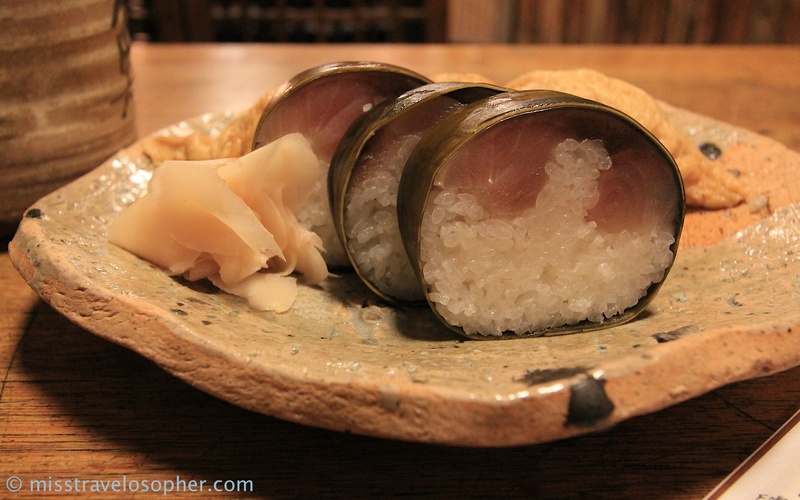 Sabazushi is essentially pickled mackerel fish on vinegared sushi rice and wrapped in thick konbu (kelp). The ratio of the fish:rice is high at around 50:50 and looks really different from the usual Tokyo nigiri sushi which we are usually used to (a slice of raw fish on a ball of rice). Sabazushi is a beauty to look at and is even better in the mouth. Izuju also offers takeaway services where whole or half rolls of sabazushi are available for purchase. When I was there for dinner, the restaurant was surprising rather empty but there were many locals waiting in the takeout queue. 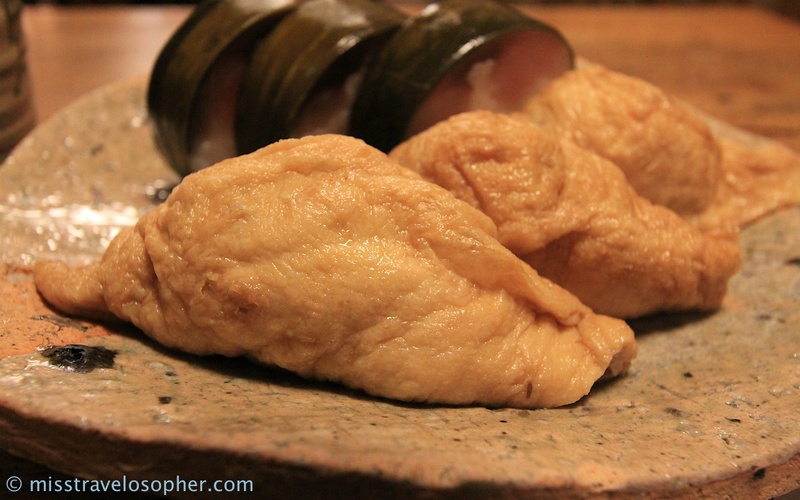 Izuju is also famous for inari sushi – pockets of fried beancurd skin filled with vinegared rice. These little beancurd pockets sat delicately on the plate and glistened under the light. Izuju’s inari sushi was nothing like what I’ve eaten before as the rice was flavoured not just with vinegar, but had extra bits of things in it. I apologize for describing it as ‘bits of things’ as I had no idea what was in the rice, but it looked like little balls of spice that were the size of pepper seeds. (I forgot to take a photo of the flavoured rice). To be honest, I wasn’t too used to the taste of Izuju’s inari sushi. 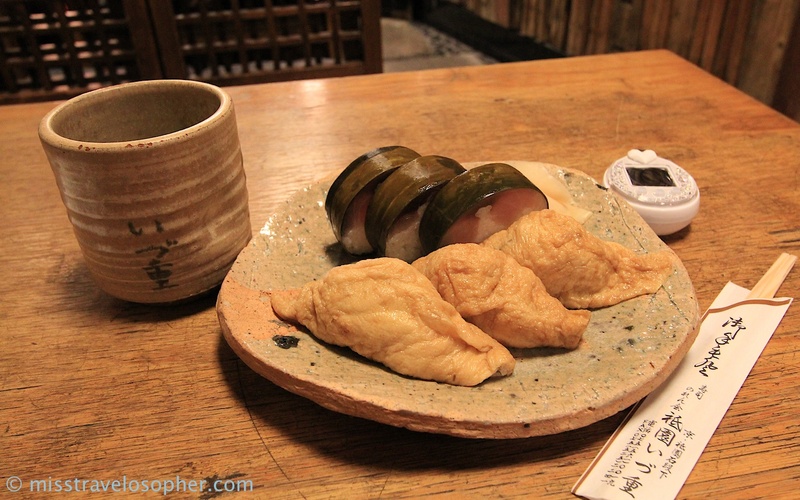 However, that’s just me as Izuju’s inari sushi is supposedly of fame and probably the best in Kyoto, if not the world. 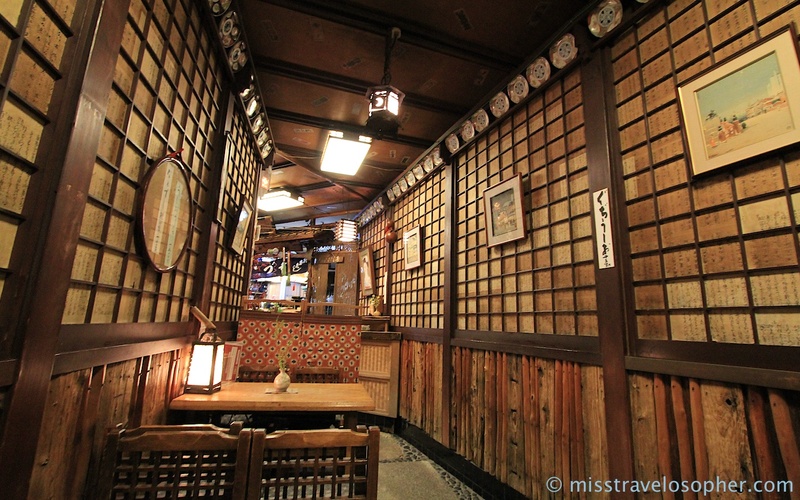 The interior of Izuju is really historic and quaint with panels of wood. It looks like it has been around for a really long time. If you are going with friends, you can consider ordering sabazushi in half roll (2,000yen) or full roll portions. By bus: Take 100 or 206 from Kyoto Station and alight at Gion bus stop. your blog is really awesome, thanks for writing them. we will try to visit some of them when we go next month!